Left to right: Claire Bowen, Maria Gibbs, and Nicholas Myers. 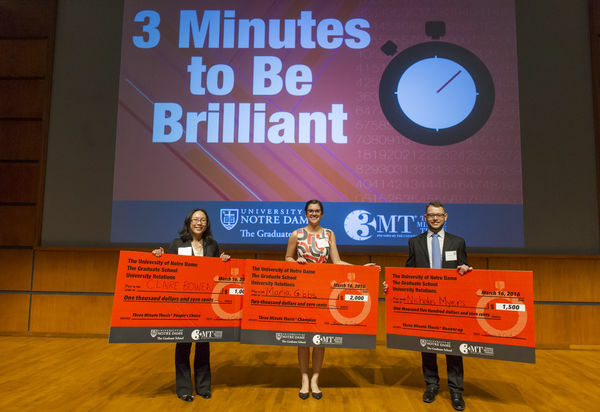 At the Three Minute Thesis competition (3MT) on Wednesday, March 16, nine graduate students at University of Notre Dame competed for prize money and a bid to the regional championships. Three graduate students from the College of Science competed. Nicholas Myers in the Department of Chemistry and Biochemistry won second place, and received $1,500, and Claire Bowen in the Department of Applied and Computational Mathematics and Statistics won the People’s Choice Award and received $1,000. Maria Gibbs, of the College of Engineering’s Department of Civil and Environmental Engineering and Earth Sciences, took first prize and received $2,000. Through a presentation titled, “Big Brother in Big Data,” Bowen shared her work on addressing consumer privacy concerns. She is working on an algorithm that provides a high level of privacy protection for media users and on-line consumers while preserving the statistical structure of big datasets for researchers, corporations, and government agencies. Her research provides a means for addressing the confidentiality issues of Big Data. Originally published by Marissa Gebhard at science.nd.edu on March 18, 2016.